Last week as I was taking my students out to car line one of the moms just asked me, "What is your favorite cookie?" Now, to a pregnant lady, those words are amazing. She was telling me about a new dessert place in College Park called Sugarbuzz Dezert Company. Her son loves to go there for an afternoon treat after school and offered to pick one up for me. About 15 minutes later there was a knock on my classroom door and it was a special delivery. The classic. Our Chocolate Chunk cookie has big chunks of bittersweet chocolate in a rich buttery cookies. This is our number one selling item. Do you like sweet and salty? Our Chocolate Chunk cookie has big chunks of bittersweet chocolate in a rich buttery cookie and we top it with coarse sea salt for the ultimate sweet and salty treat. I saved them until I got home so Mike and E could enjoy them with me and all I can say is that they were DELICIOUS. They were buttery, sweet, salty and melt in your mouth yummy. 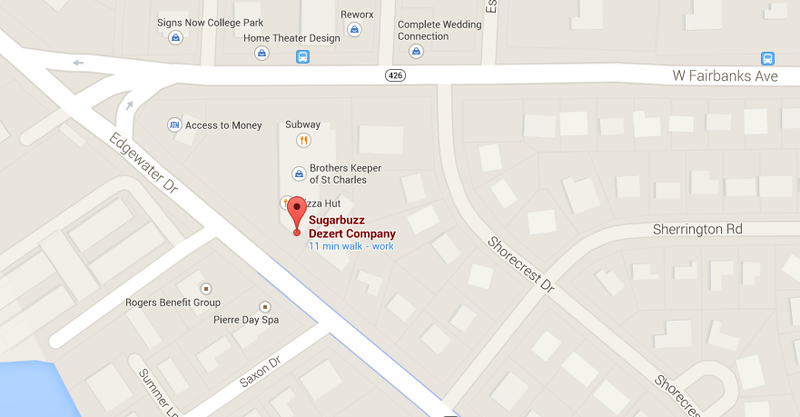 Located at 4339 Edgewater Drive in Orlando, Sugarbuzz also offers cakes, cupcakes, pies and classic cheesecakes in addition to their delicious cookies.